There are exactly 87 days until Leadville 2011. After looking at version seventeen of my training plan today, I was reminded that the time available to actually prepare for this ridiculous idea of a run is rapidly diminishing. If I have a five week taper or so, that leaves about eight weeks of hard training. Eight weeks. Since the training plan started back in October of last year, you can understand why I might be feeling a little bit of increased pressure. There is also the fact that there are seventeen versions of the training plan because I generally haven't done a very good job of following the plan. Skipping runs, getting sick, being lazy, reading blogs about running, and being generally unmotivated get in the way of logging miles. All that to say: there's no turning back. It's go time. There can be no quitting, no stopping, no giving in, just moving forward. There are no guarantees that any of this will produce the result, but I'm committed to this course and I will pursue it. Every day for the next eight weeks I have to remain focused on the goal. Having been a high school sports coach I am prone to cheesy motivational activities. So a few months ago I "bought" something that was gouda-flavored. 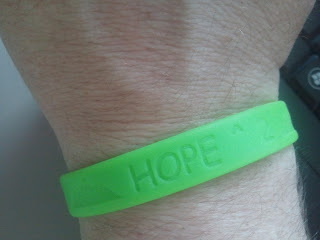 It's hard to see but the band says Hope ^2 or Hope Squared. Then there are some mountains on both sides of the words. What does it mean? Well for me there is a spiritual component to my hope and there is a running component to my hope. The underlying principle of both is that hope has to be lived out practically. If I place my trust and faith in God or on anything else, (like the idea that I could finish a 100 mile race in the mountains) then my actions will match that. If I believe in the possibility of earning a buckle, then I necessarily will run. And train. And stop trying to relive episodes of Man vs Food at home. The other layer of meaning for Hope ^2 is of course that to finish the race you must go over Hope Pass at 12,600' of elevation. Twice. So why wear a bright green, glow in the dark (ok, I love that part, it will help guide me on the trails through the night, right? Also, it freaks out teh wifey :)) piece of silicone? Well for me, it's like a string tied around my finger. It is there to remind me. I need to be reminded of what my goals are, what I need to do to try and get there, and most of all to remind me where my hope is placed. Cheesy? Yeah, go cut a slice. Hopeful? I am.